Cadence is a clothing brand that was started by a former bike messenger by the name of Dustin Klein. As a rider he knew what he wanted in a pair of jeans, so tired of what was available, he made his own. 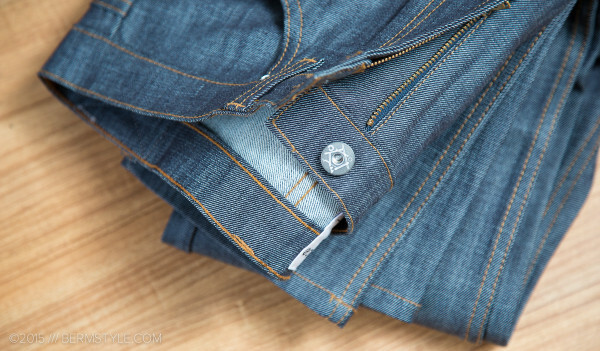 One of the problems he wanted to address with Cadence denim was wear and tear in the seat area, while still offering a pair of “normal” jeans. The Cadence raw denim jean has a tapered leg fit, which helps in preventing interference from your drive train. The most “bikey” feature though, is the reinforcement in the seat area. You won’t find a ton of reflective elements, (there’s a reflective patch with a logo, but if you wear a belt, it’s covered) extra pockets or other extraneous stuff, and while I might have expected to see a seamless crotch, they’re actually pretty similar to other raw denim jeans with stretch. 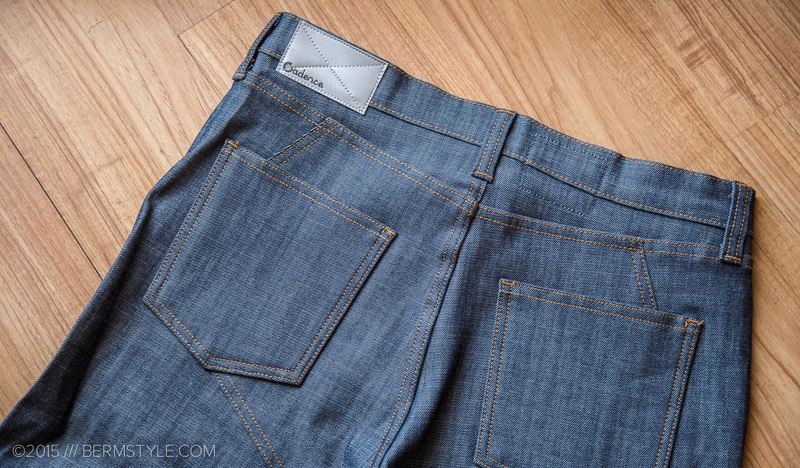 Detail of the seat reinforcement on the Cadence jeans. Although the crotch has normal seams, on the bike it’s not really noticeable. 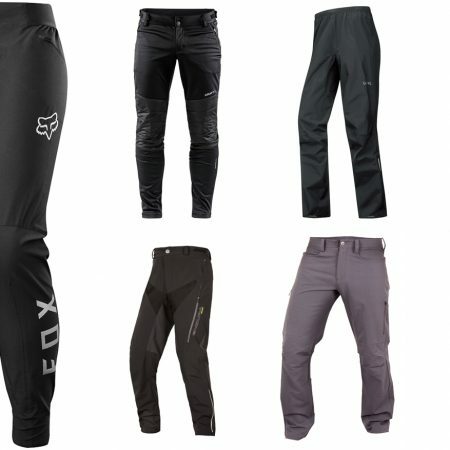 I don’t put on jeans if I’m doing a “real ride” anyway, I have tons of other riding gear to choose from. But for cruising around all day on a bike, (you know, #bikelife stuff) they’re solid. When first donning the raw denim jeans, they felt quite stiff. The break in process was inline with other raw denim jeans I’ve owned, though the 2% spandex content goes a long ways to speeding it up and adding to the comfort level. 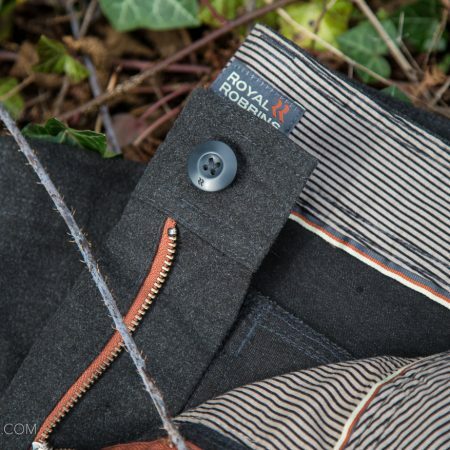 Without that bit of stretch, breaking in raw denim can be a chore, and truth be told, I’ve given up wearing jeans without that crucial bit of lycra. Out and about in Portland, Oregon. 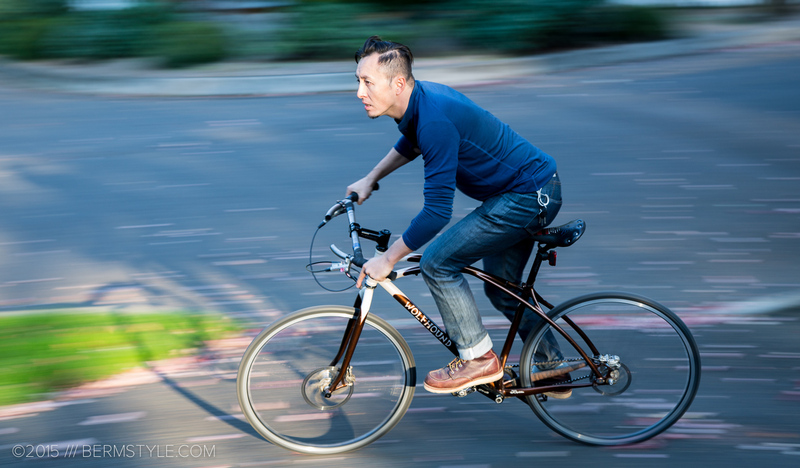 Paired with the Shower’s Pass bamboo merino henley shirt. Having worked at a clothing company in SF for the last four years, I’ve accumulated quite a few articles of clothing. 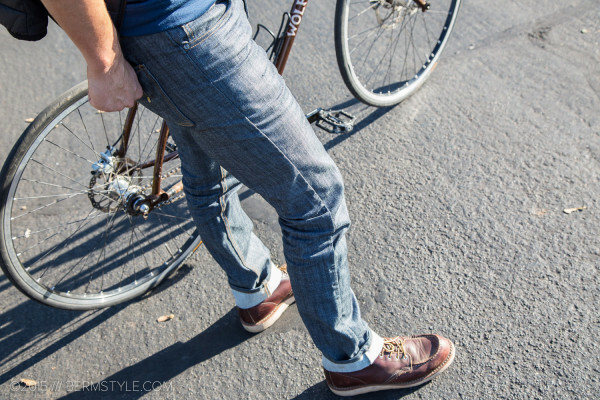 When it comes to pants though, I pretty much just wear bike jeans. From my experience in wear testing denim, I think these guys are on to something here. 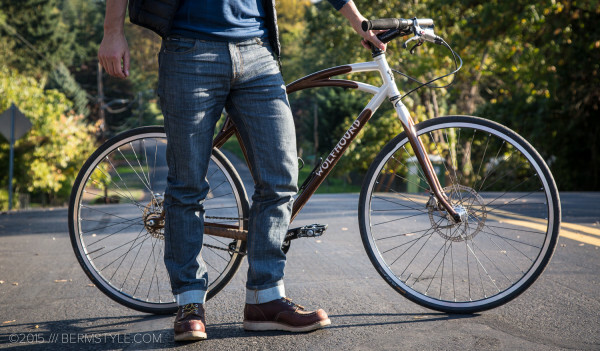 I own quite a few models and brands of bike jeans and the Cadence jeans are the first that address the issue of wear in the seat area. So many of my bike jeans tend to blow out on the seat, as it’s the primary wear point with the bike. After that, the other wear points tend to be the knees, likely due to my primary profession as a photographer and a lot of couching while snapping photos of stuff. Cadence raw denim has a tapered leg fit. The choice of the denim wash plays in here as well. I generally wear jeans with a black or dark indigo wash. The downside is that wear and tear and color fade tends to show up quickly with dark colors. 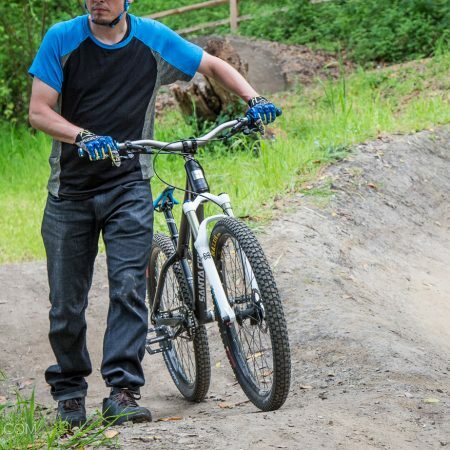 Minimal washing goes a long way to keeping jeans looking fresh, as regular riding tends to be tough on jeans and the seat and knees tend to fade over time. The light wash of the Cadence jeans mean these changes are less likely to be noticeable. On or off the bike the jeans are comfortable, and have broken in well. Though initially a snug fit, they’ve relaxed a bit in the thigh and seat area, and have softened up significantly over time. 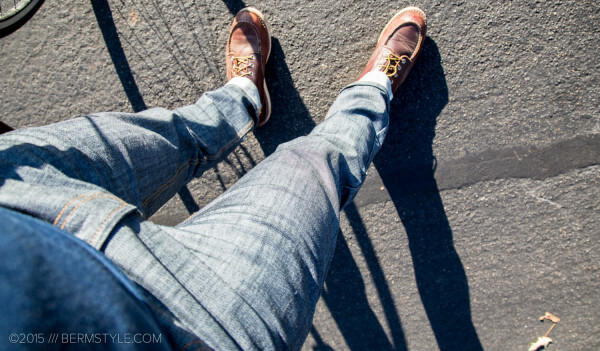 Cadence raw denim has a light color in the sun. Here’s where things get rather personal; fit when shopping for jeans is extremely subjective. Cadence raw denim jeans worn cuffed with Redwing boots. In the last few years my tastes in jeans have run the gamut from slim to skinny to fitted jeans. These days I’m somewhere in between, but lean towards fitted or slim, without being restrictive. Overall, I’m a fan of the Cadence jean, though my preference would be to have a rise a bit lower in the front. Other than that, they fit well and and they’re Inga-approved, which goes a long way. 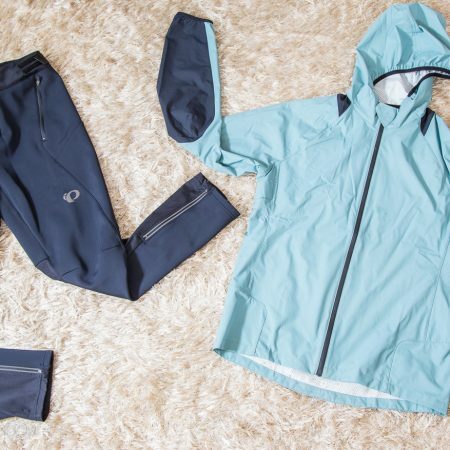 For those with oversized thighs, they’ll be quite snug to start. If you prefer a more relaxed fit, going up a size with a belt could be a solution. My method of breaking in bike jeans is to do a few quick squats after I get them, but nothing beats going out for a bike ride. 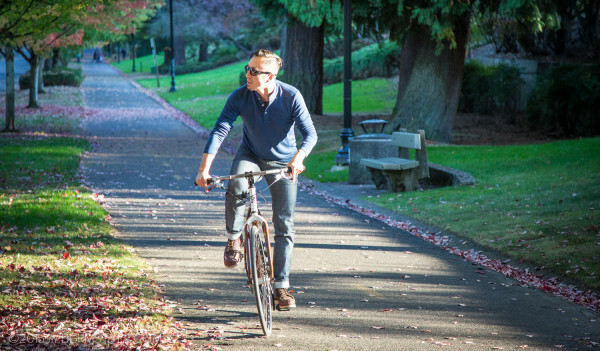 Cruising the 205 multi-use path in Portland, Oregon. At $110 they’re priced well for a designer raw denim jean made in the US. (cause here’s where people complain about the price on anything bike related) Yes, you can get jeans for less. But bike friendly jeans with lycra are amazing, and if you haven’t tried them consider trying on a pair. Plus your off the shelf jeans from Target aren’t made in the US, and you’re supporting a small business made up of rad bike people, as opposed to a sweat shop overseas.